We are happy to announce the release of a new open textbook. 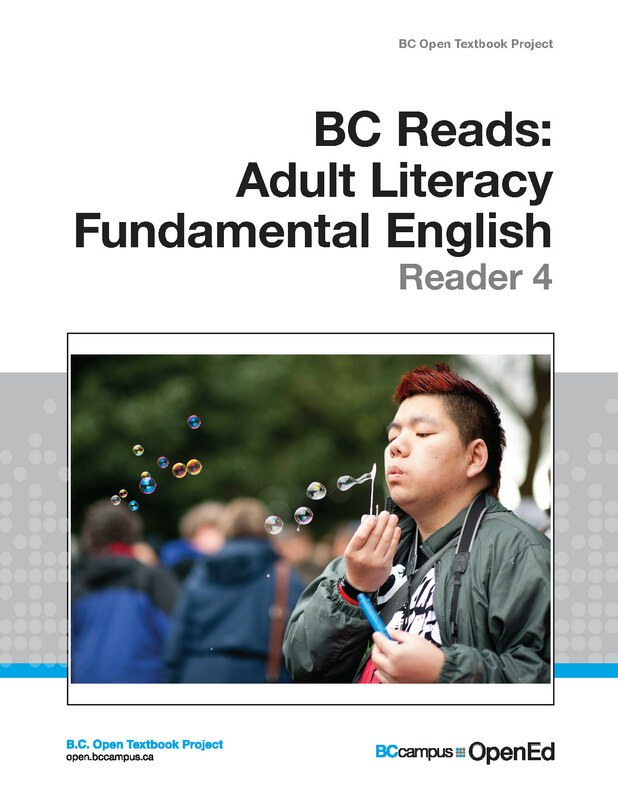 This reader contains nine original stories written specifically for adults, and is designed to accompany the BC Reads: Adult Literacy Fundamental English – Course Pack 4. This level 4 reader, one of a series of six readers, is roughly equivalent to grades 4.5 to 6 in the K-12 system. Each story mirrors a chapter in the accompanying course pack. New vocabulary are set in bold throughout each story, and then summarized and defined in a Glossary found in the appendix. Font size and line spacing can be adjusted in the online view, and have been enhanced for the print and PDF versions for easier reading. This reader has been reviewed by subject experts from colleges and universities. This book has been released under a CC-BY 4.0 license and is now available in the BC Open Textbook collection.